The year's best meteor shower peaked last night (Dec. 13), giving skywatchers around the world an incredible show. 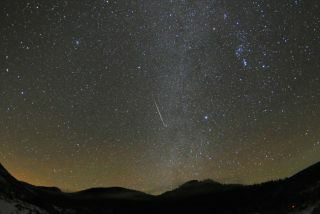 "Best meteor shower I have ever seen," James Champagne, viewing from Madera Canyon, Ariz., wrote on the site SpaceWeather.com, where he posted several pictures of the Geminid meteor shower. "The show was impressive allrite," he wrote to SPACE.com. "Seeing 5-7 meteors per minute was normal. Often times 2 meteors at a time." The Geminid meteor shower is an annual mid-December rain of meteors that occurs when Earth passes through a stream of space rock debris. As these small rocks fly through the atmosphere, they burn up, creating shooting stars. Geminid meteors should still be visible for a few days, though their peak has passed. "I saw 50 Geminids in two hours in spite of a very luminous moon, so it was a good show this year but not an extraordinary one," Guillaume Cannat, who watched from Mont Aigoual in the south of France, wrote in an e-mail to SPACE.com. Cannat was able to capture a gorgeous photo of a meteor streaking across the star-speckled indigo sky. Viewing from Cloudbait Observatory in the Colorado Rockies, Chris Peterson said he saw a good show. "I captured 229 Geminids on the peak night, and 363 over four nights," he wrote in an e-mail. "I estimate the peak visual rate at 120 meteors per hour." Others, however, had less favorable weather to watch the show. "The weather in Colorado recently has been perfect... for skiers and snowboarders, not stargazing!" said Jimmy Westlake, an astronomy professor at Colorado Mountain College in Steamboat Springs, Colo. But Westlake was able to catch a few hours of clear skies between snow storms on Sunday (Dec. 12). That night, over the course of about three hours, "I (unofficially) counted 3-4 dozen Geminid meteors," he wrote in an e-mail. Luckily, he was able to capture one of the brightest Geminids of the night in a photo of a bright streak running through the plane of the Milky Way. Viewing from Hermosillo, Mexico, Salvador Aguirre captured a bright streak low on the horizon with an all-sky camera. And Sylvain Weiller from Saint R?my l?s Chevreuse, France, caught a Geminid on video. "Could not believe it :) Was not a plane, nor a satellite nor an Iridium ... I must had some incredible luck to get such a Geminid," he wrote on SpaceWeather.com, where he posted the video.